You are here: Home / Advertising / Food Inc. Review: Will Kids Be Hungry For Change? 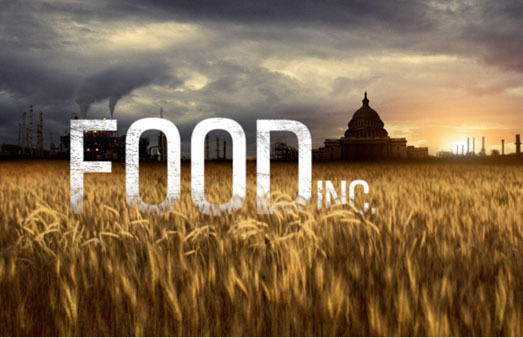 July 22, 2009 Food, Inc. is making the rounds in art house theaters throughout the nation, and though I have yet to see it (going in Palo Alto soon!) we have Amy Vachon of Equally Shared Parenting (for parents who aspire to share in childraising, breadwinning, housework and time for recreation) with her review from Boston today. My guess is the Vegetarian Kids & Teens resource group may get a lot of site hits following this documentary if parents bring their offspring to this PG flick…especially since adolescent vegetarianism appears to be on the rise with the CDC loosely reporting 1 in 200 kids (particularly on the coasts) going “animal free” in their wishes and ways. If kids liked the ‘Ewwwwwwwww” impact of Morgan Spurlock’s documentary “SuperSize Me” they’ll no doubt respond to Food Inc. equally well (it’s rated PG) as it’s more digestible than Fast Food Nation, which I blundered into sharing with my daughter as her first ‘R’ rated movie (big mistake) a couple of years ago. Then there’s the whole veggie scare of e-coli and such, with health commentary coming from all angles…So regardless of personal ethical and health opinions (btw, here’s what I’M trying for dinner tomorrow, I’ll tell you how it flies!) 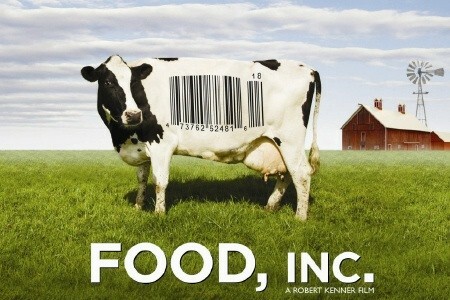 I say huge applause is owed to films like Food Inc. for raising awareness for a healthier food chain for us all!!! Meanwhile, here’s ‘the other Amy’ on the east coast who snagged tix to a Chipotle sponsored FREE screening of Food, Inc. I was psyched to score two free tickets to the new documentary, Food Inc., in Boston last night – courtesy of Chipotle restaurant, which is sponsoring free showings in strategic locations across the country this month. I’m a big fan of the two authors who inspired the making of this film: Michael Pollan (The Omnivore’s Dilemma) and Eric Schlosser (Fast Food Nation). In fact, it has now been over 7 years since I’ve set foot in a fast food mega-chain (except perhaps to use the bathroom) – which is entirely due to reading Fast Food Nation at all hours of the night while nursing my first baby way back then. So, I happily marched into the theater last night, assured of a cinematic treat. Filmmaker Robert Kenner didn’t disappoint. In small vignettes, he peels back the veneer on our nation’s gastronomic bounty to reveal its very, very dark innards. Taking some of the most disturbing, and sometimes poignant, messages from both Pollan’s and Schlosser’s books, he gives us a visual tour of what it is like inside a dark chicken house, a concentrated animal feeding operation (CAFO), a pig slaughterhouse. He teaches us how just a few mega-big businesses own our food – from the seeds farmers are forced to buy every year, to the crops that are planted, to the way animals and indigent workers are treated, to the lack of regulations assuring safety and transparency in the food industry. If you’ve read the books, you’ll likely not learn much new by watching Food, Inc., although you will probably enjoy ‘meeting’ Pollan and Schlosser (and model farmer-with-a-cause, Joel Salatin from Polyface Farms) and you’ll likely walk out inspired all over again to make changes in your own food choices. If you haven’t read the books yet, Food, Inc. will open your eyes in a way that will change you forever – for the wiser. It was ironic that, after the movie was over, my husband and I had planned to stop off at the grocery store before heading home to relieve our babysitter. I found I couldn’t do it – at least not so soon. The supermarket had turned into a forest full of lions and tigers and bears just waiting to snare me. I could envision all the high fructose corn syrup products laughing like hyenas from the inner aisles while the meat section dripped blood and tears. We went to an alternative grocery store instead, and I wanted to hug all my CSA veggies (community supported agriculture) when I got home. The movie’s hopeful message is that each of us can make an important difference in how our food is grown and processed. I’m determined to take a few more steps in the direction of conscious eating after seeing Food, Inc.
Do you know when it’ll be available on dvd worldwide? .-= lelik´s last blog ..Pregnancy Weeks 13-16, Month #4 (Pregnancy Health Guru) =-.